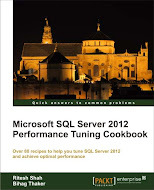 If you are new to SQL Server 2008, if you want to learn new features of SQL Server 2008, if you are well aware with SQL Server so don’t want to learn how SELECT works and how INSERT works but just wanted to get good knowledge of SQL Server 2008’s features than who else can you give proper guidance other than Microsoft. I found one small book about SQL Server 2008 from Microsoft press itself, written by Peter DeBetta, Greg Low, Mark Whitehorn. You need to register there before downloading it; this would really be a good starter for new joiner of SQL Server 2008.